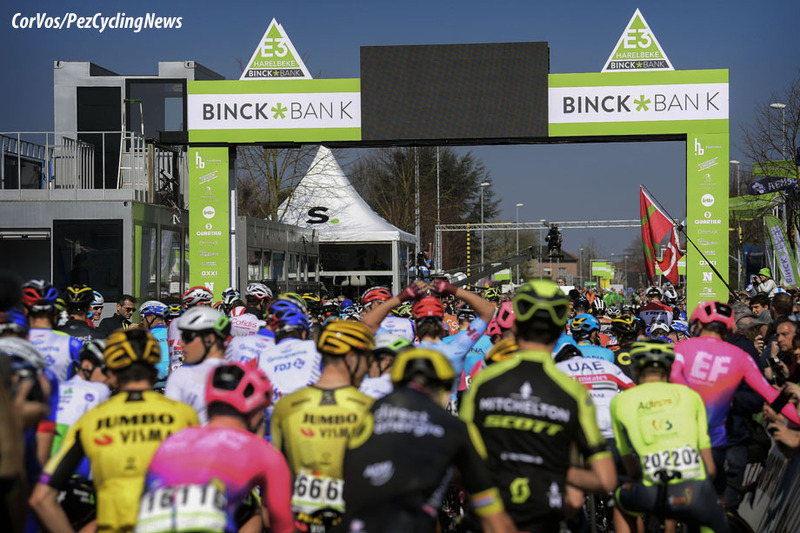 PezCycling News - What's Cool In Road Cycling : E3 BinckBank Classic’19: Stunning Stybar! 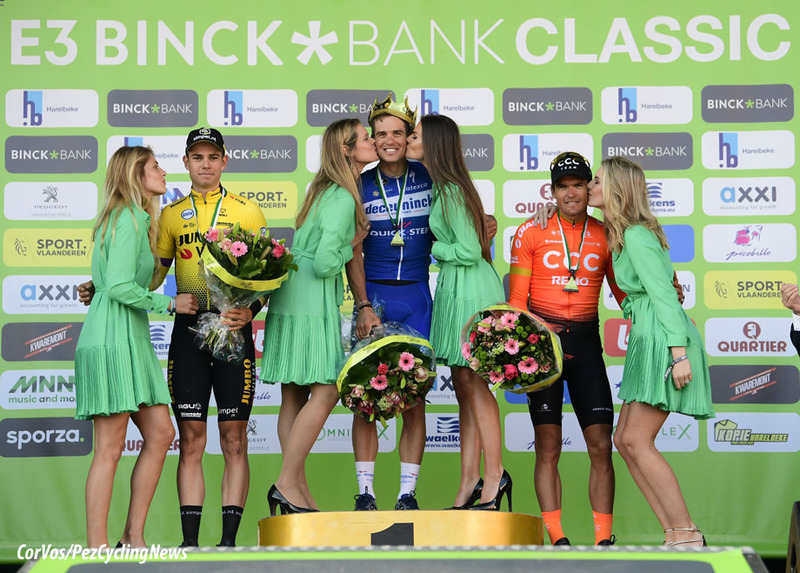 E3 BinckBank Classic’19: Stunning Stybar! 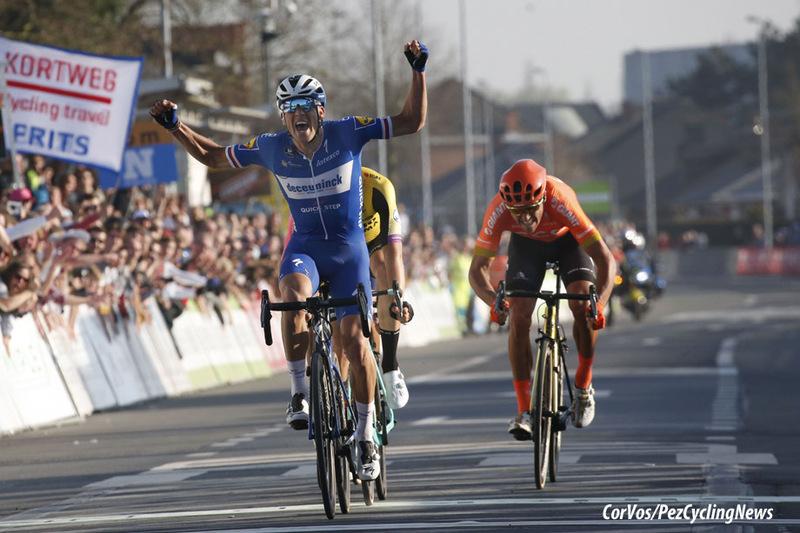 Race Report: Zdeněk Štybar (Deceuninck - Quick-Step) won the E3 BinckBank Classic for the first time in his career to add to his Het Nieuwsblad win at the start of the month. 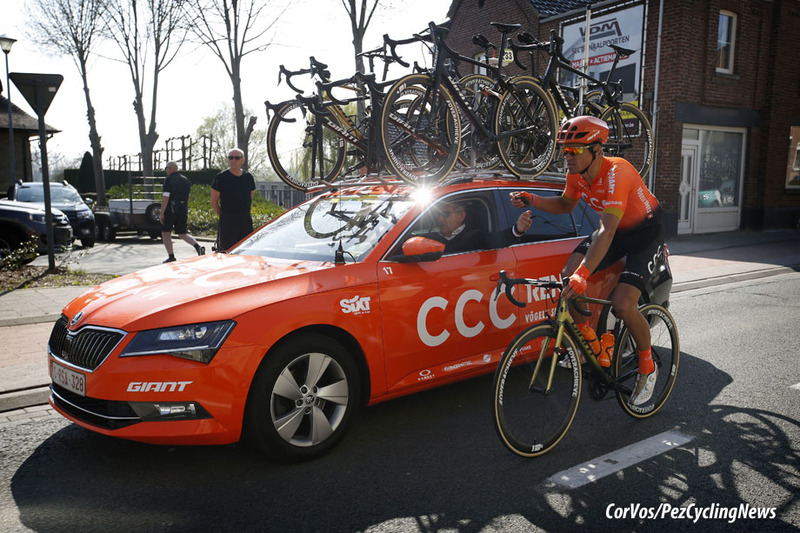 At the finish in Harelbeke he was the fastest in the sprint from Wout van Aert (Jumbo-Visma), Greg Van Avermaet (CCC), Alberto Bettiol (EF Education First) and his teammate Bob Jungels. 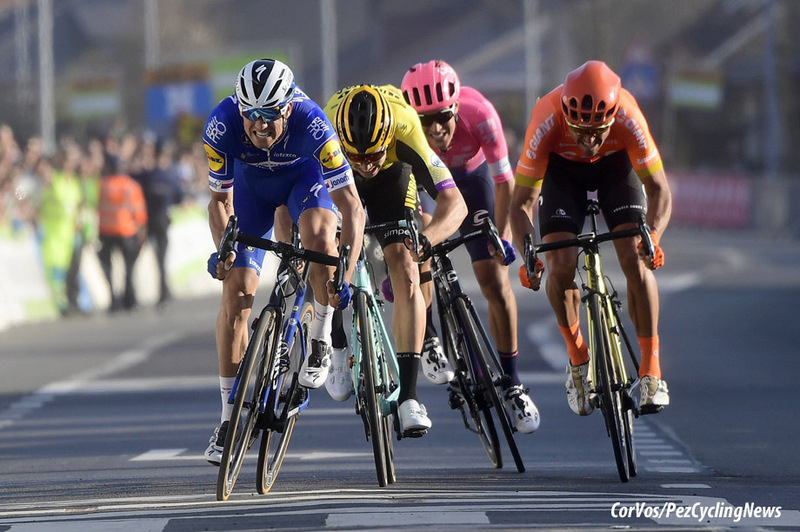 On a sunny Friday afternoon in Flanders, the Deceuninck - Quick-Step team again showed their dominance. 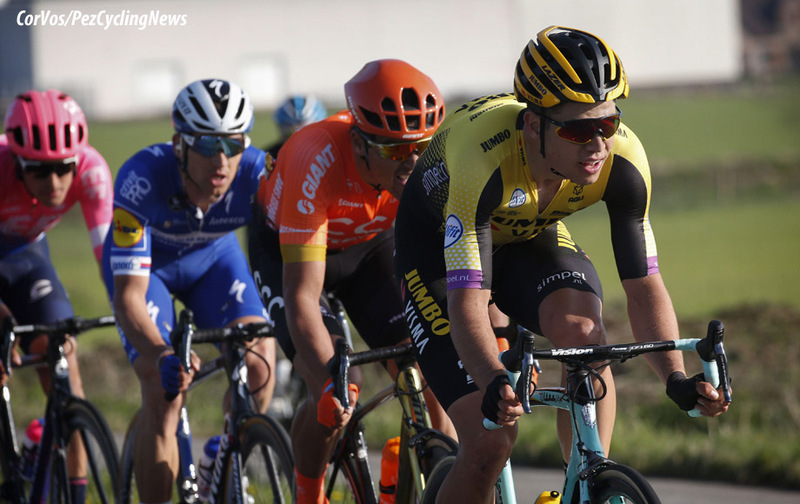 With a perfect one-two punch by Bob Jungels and Zdenek Stybar, the Belgian team had Wout van Aert, Greg Van Avermaet and Alberto Bettiol on the ropes for the final sprint. Stybar had the measure of the two Vans for the win. 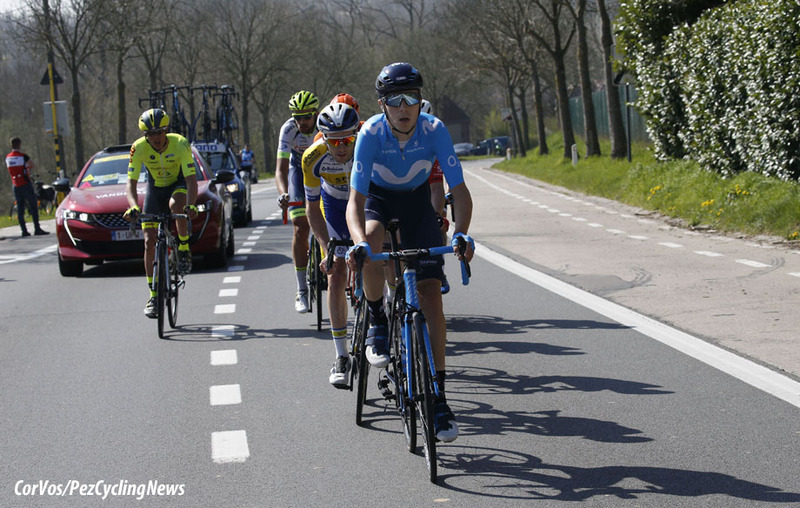 The break of the day took its time, but eventually seven riders got free: Jaime Castrillo (Movistar), Marc Hirschi (Sunweb), Aksel Nõmmela (Wallonie Bruxelles), Thomas Sprengers (Sport Vlaanderen-Baloise), Stijn Steels (Roompot-Charles), Mihkel Räim (Israel Cycling Academy) and Ludwig De Winter (Wanty-Gobert). 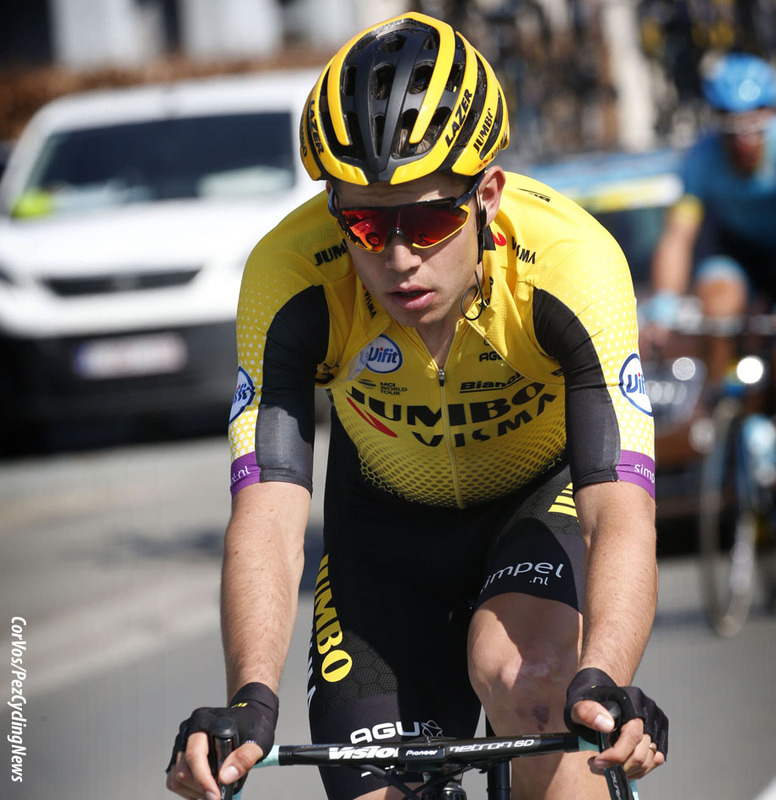 Lionel Taminiaux (Wallonie Bruxelles) also made it across to the leading group. 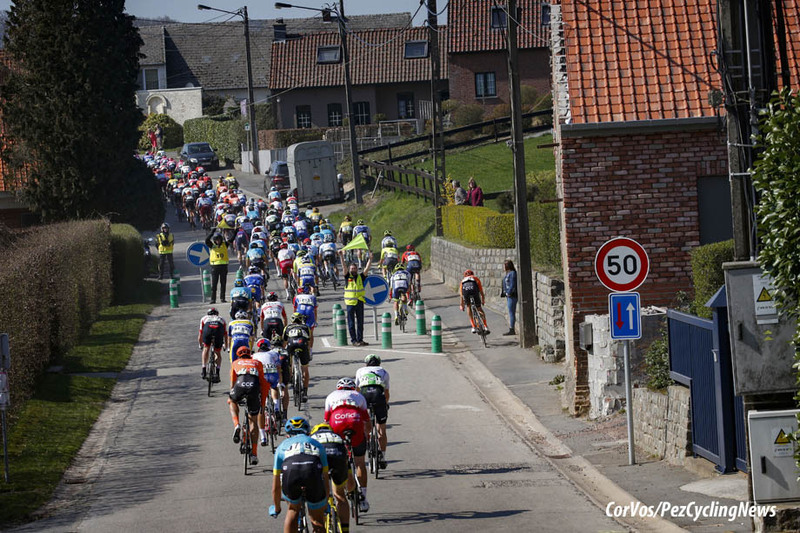 In the run-up to the climb of La Houppe, the eight extended their lead to 5 minutes. This was their maximum because the peloton started to chase. With half the race gone, the lead group still had 2:30. 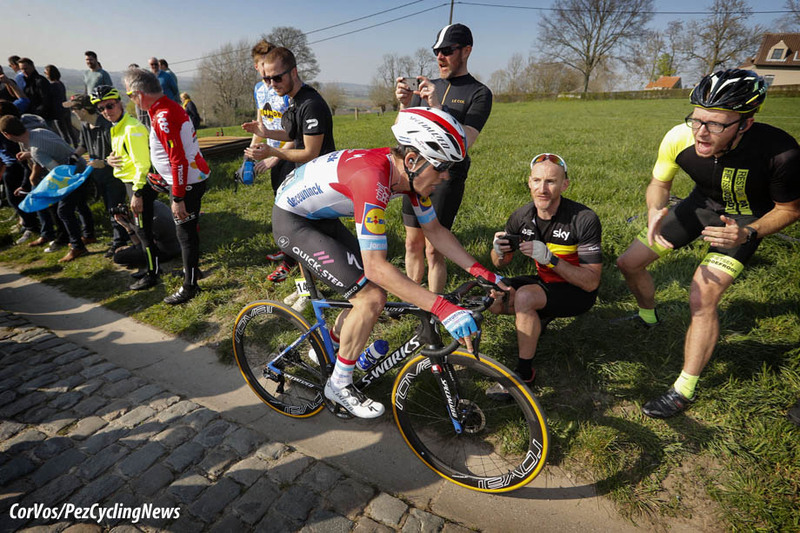 Sep Vanmarcke (EF Education First) crashed into a ditch 85 kilometers from the finish line and had to abandon. Peter Sagan (Bora-Hansgrohe) attacked on the Taaienberg putting the peloton into two parts, but the race came together again. 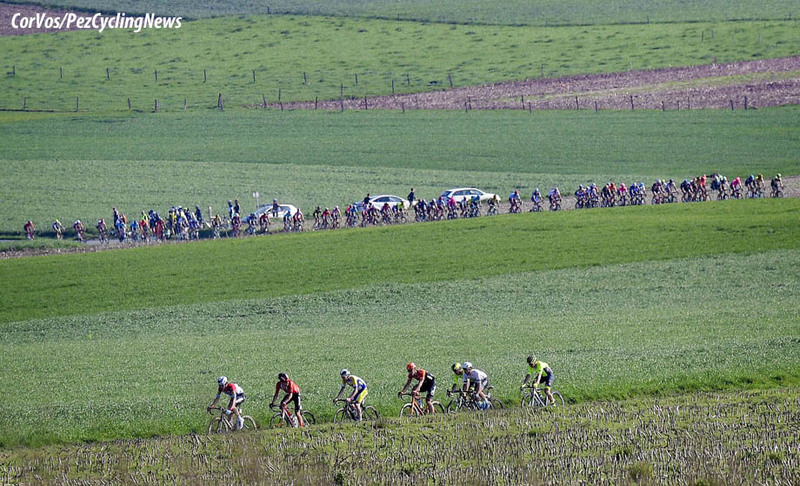 Although riders were dropped over the following kilometers. 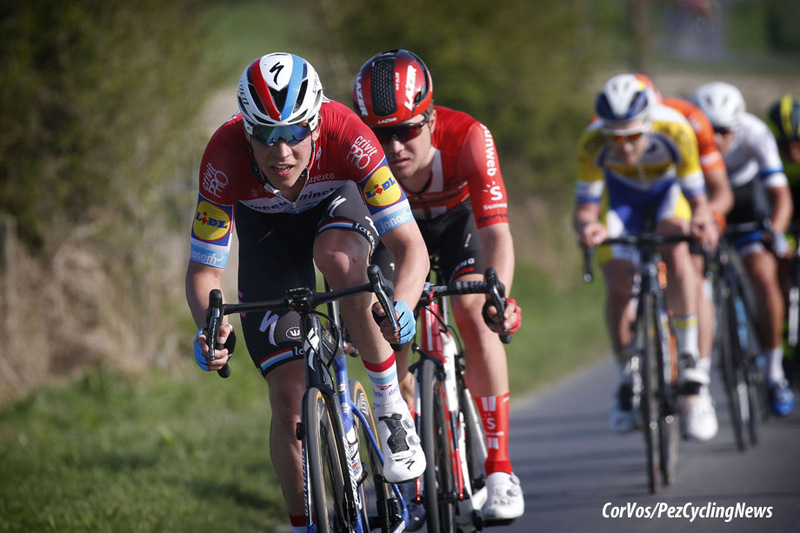 On the Boigneberg it was the turn of Zdeněk Štybar and Tiesj Benoot (Lotto Soudal), but it was Bob Jungels who put in the big attack. 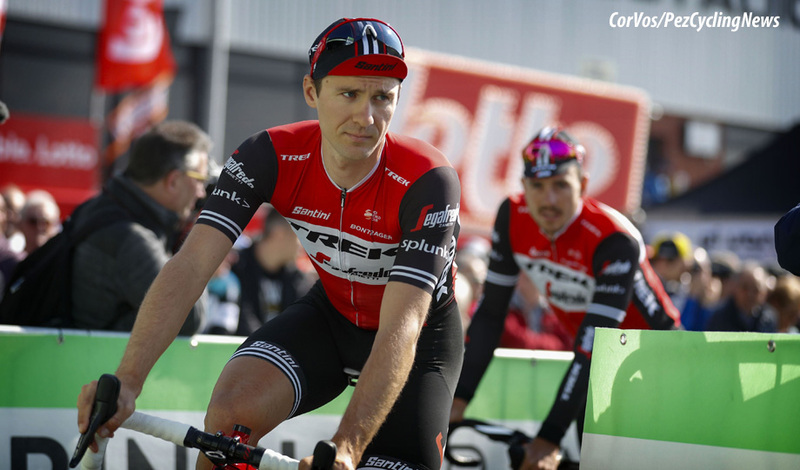 The early leading group was caught to put six riders up front for the Paterberg-Oude Kwaremont. Jungels had Hirschi, Sprengers and Steels, with Nils Politt (Katusha-Alpecin) and Jasha Sütterlin (Movistar) managing to cross. 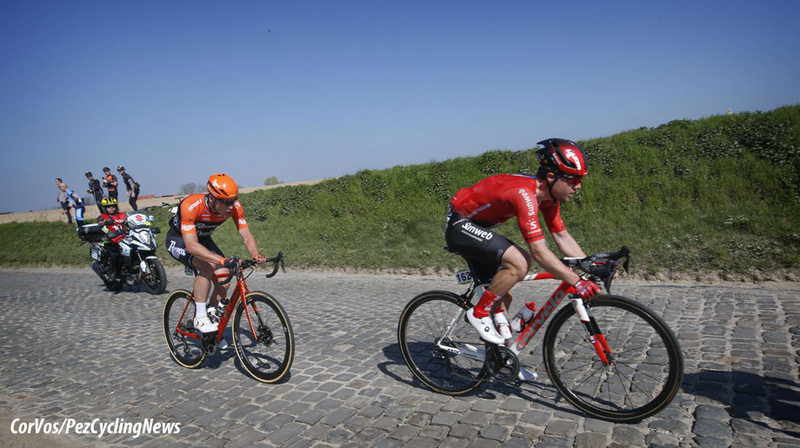 Jungels, who previously won Kuurne-Brussels-Kuurne, turned out to have great legs, which he showed on the Paterberg, where only Hirschi could follow. 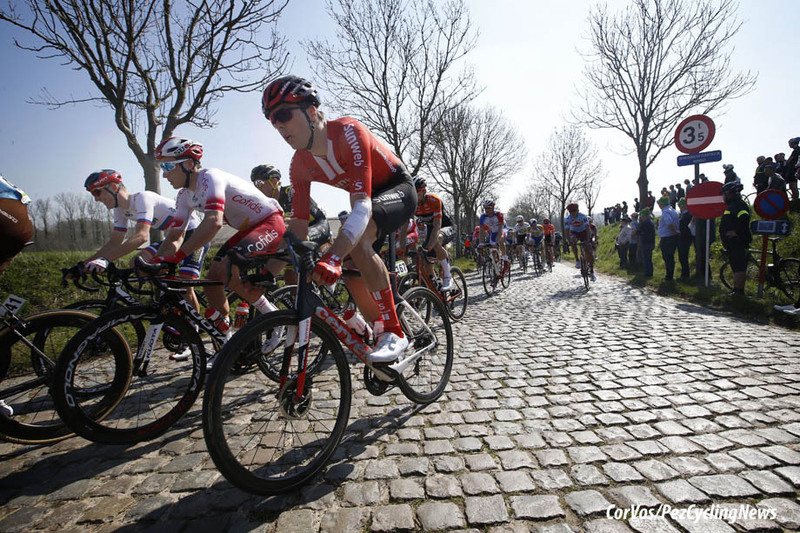 Although Politt and Sütterlin were able to rejoin, Jungels went again on the Karnemelkbeekstraat. This time the others couldn't follow and the Luxemburger went solo. Hirschi, Politt and Sütterlin were caught by the chasing group of favorites, Jungels extended his lead to 45 seconds. 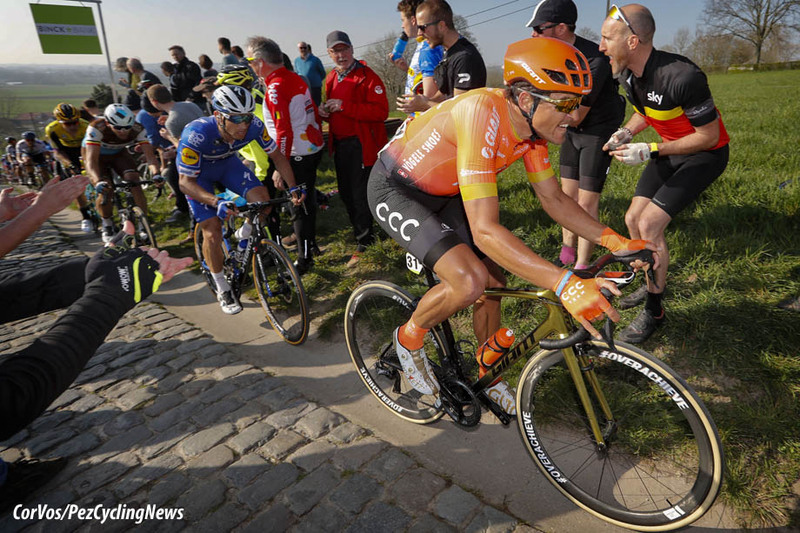 Wout van Aert, Alberto Bettiol, Zdeněk Štybar and Greg Van Avermaet started the pursuit after the Tiegemberg slowly pulling in Jungels. 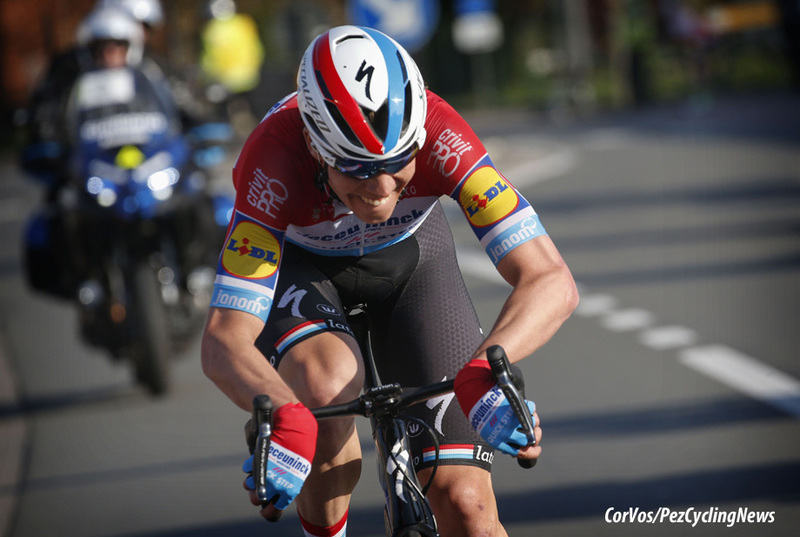 Seven kilometers from the finish Jungels was caught by the four chasers, but he then worked hard for Stybar. 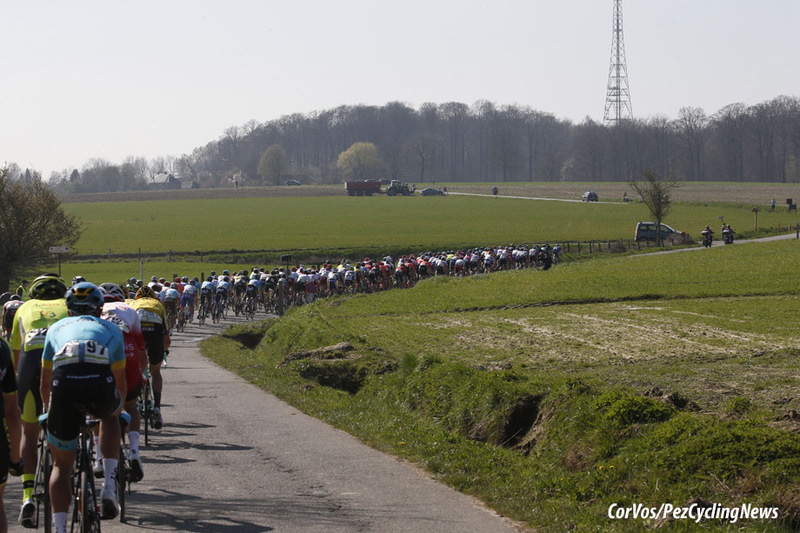 At 3.5 kilometers from the line; Stybar attacked, but Van Aert jumped on his wheel. Less than half a K further and Jungels tried again, but this time Van Avermaet pulled back his move. 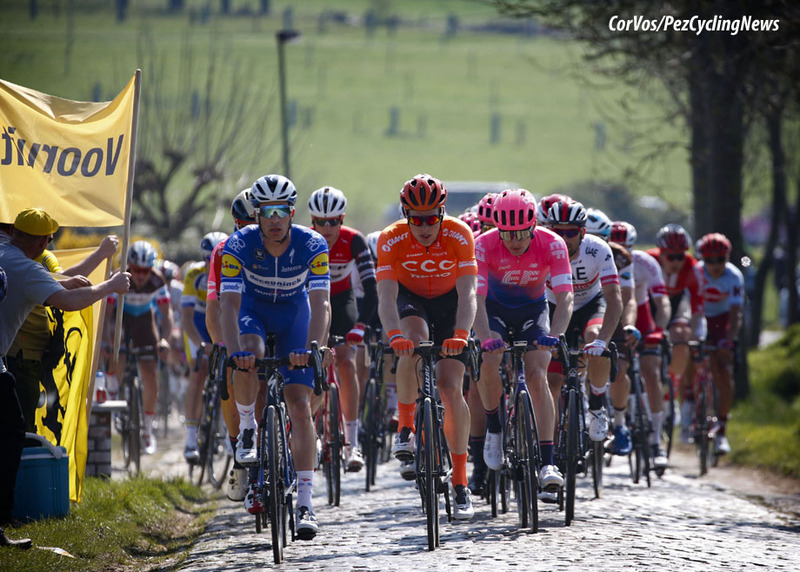 The five passed under the last kilometer flag together and it was Jungels again who led the group with Van Avermaet on his wheel. 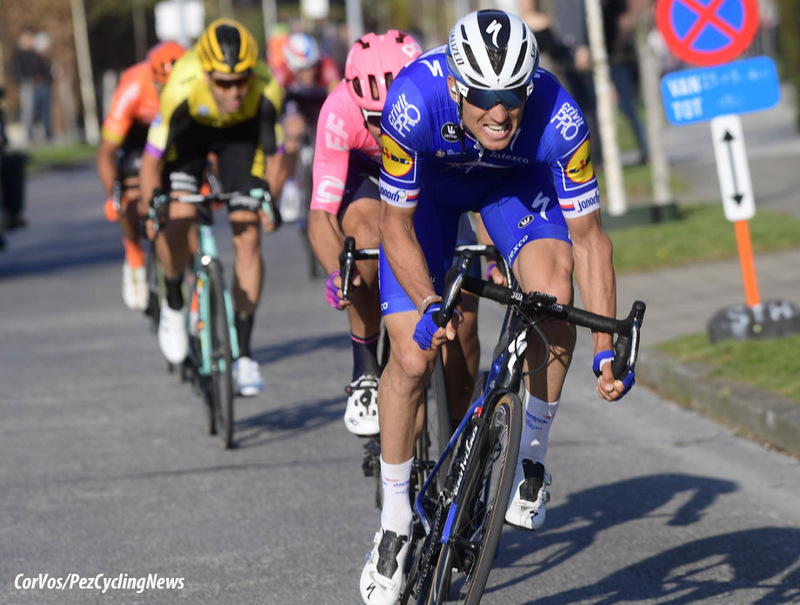 Stybar jumped hard on the pedals to hold off Wout van Aert and Greg Van Avermaet to give the Deceuninck - Quick-Step team its 12th win this season. 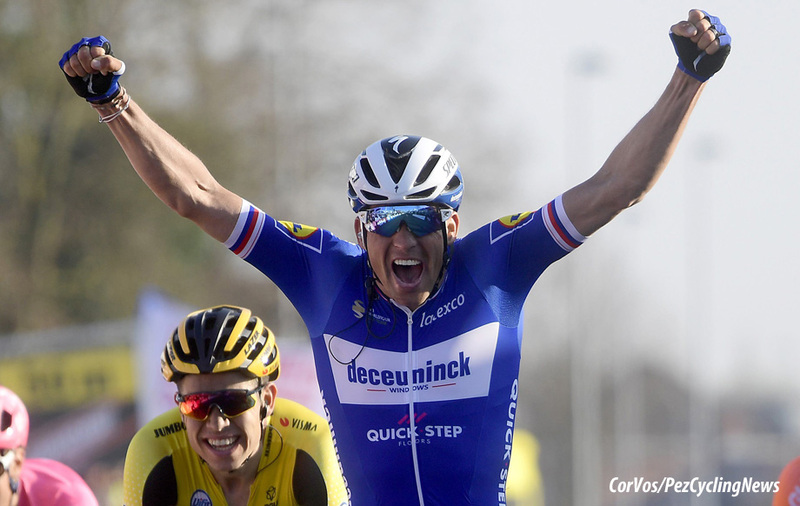 E3 BinckBank winner, Zdenek Stybar (Deceuninck - Quick-Step): "I’m incredibly happy! Winning Harelbeke after Omloop is amazing, but I couldn’t have done it without this extraordinary team. We have such a great squad, all our riders can win a race and that’s one of the things that make the difference in our favour. Bob was instrumental in my victory, I couldn’t have done it without him, so I want to thank him for his enormous help." 25. Florian Senechal (Fra) Deceuninck - Quick-Step.